Not all keys lead to freedom. Posted February 7, 2014 by Jason & filed under Design. You see it everyday (it’s probably under your nose right now) but you’ve possibly never given it a second thought… or for that matter, even a first one. It’s the QWERTY keyboard, developed in 1878 by James Densmore and Christopher Scholes for the express purpose of making typing faster… by making typists slower. The typewriters of the time could not keep up with the lightning fingers of the typists, who had to constantly stop to untangle their machines. By relocating the most useful letters to the least accessible parts of the keyboard, Densmore and Scholes slowed the typists down just enough to prevent the jamming. Which meant less time fixing, more time typing and paradoxically, greater productivity… through inefficiency. 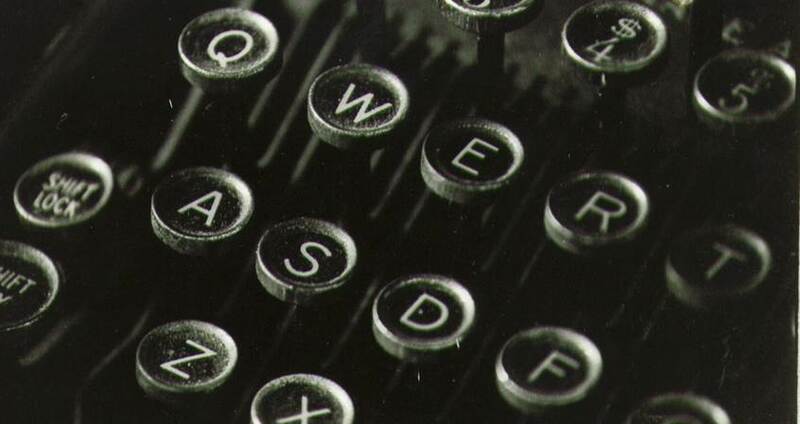 The jamming problem disappeared with the invention of the golfball typewriter in the 1960’s but by then nearly three generations of typists were so used to QWERTY they were reluctant to change. Even today most typists are passionate defenders of a system expressly designed to make their job harder (which it still does, to this day). The QWERTY story teaches us that a quick fix can outlive the problem it was invented to solve, to become a problem in its own right. It’s also a sobering demonstration of the power of habit: how an out-dated and unnecessary handicap can be protected by the very people it impedes. And it even raises a philosophical question that bothers designers to this day: why fix the product… when we can just change the behaviour of the user?